Do you like football, soccer and strategy games? Football Tactics is definitely for you. 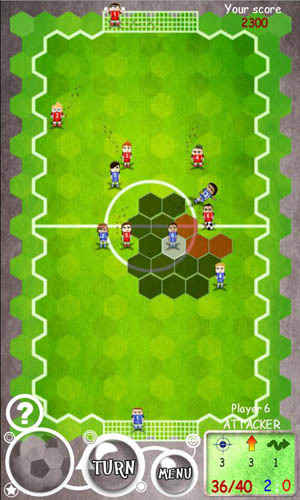 Football Tactics is the new approach to the hex turn-based strategy games. 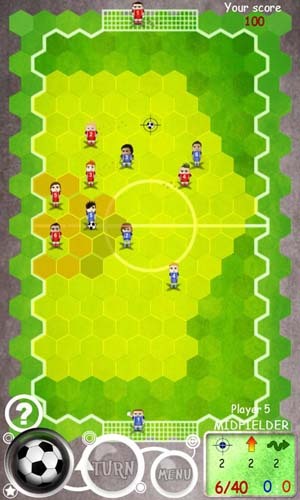 It combines gameplay typical to regular hex games with basics of the football tactics and strategy. If you have played football games like FIFA, Real Football, Football Manager you will become the fan of Football Tactics! This is a football hex turn based strategy with gameplay similar to Great Little War Game, UniWar or Heroes of the Might and Magic. This is not another tower defence game like Robo Defense, Monster Defense, Castle Defense or Grave Defense. 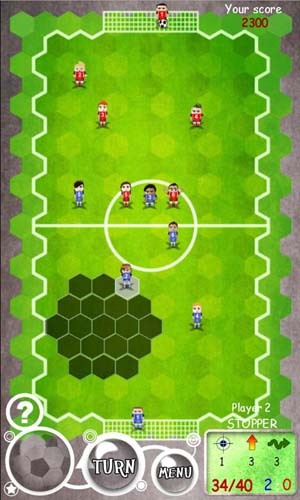 Football Tactics is much more challenging hex turn based strategy in which you have to master your strategic skills to control you units and win the match! There are no typical missions, enemies and battles in Football Tactics like in regular strategy games. Soccer players are your units, football team is your army, football field is your battle field! Each soccer match is a different mission. You can choose between eight different teams and choose one of two initial tactics options. Teams are not the real football clubs and there is no real football league which will limit you. Football Tactics gives you 8 unique teams, with different abilities and preferred strategies. 1. First you have to choose your favourite team with players adjusted to your strategy. Then select your preferred style: offensive or defensive and begin playing on the hex football field. 2. Remember that Football Tactics is not a regular soccer game. It is a hex strategy, in which you have to plan your moves in each turn. 3. In the single player mode, your goal is to defeat AI opponent. To do this, use your soccer team to gain advantage on the hex football field. You can win the match only if you plan your strategy carefully, taking units abilities into account! 4. Each one of your players can move, tackle, pass or shoot the ball. Use the ball button to switch between move and pass modes. 5. Multiplayer mode enables you to play with your friends on one device. In this mode your highscore is not updated. 6. As in all strategy games, you have to adjust your tactics to the opponent. Analyze your opponent's moves to plan your own strategy. Mastering your strategis skills is essential. Remember that football tactics gives you and your opponent 16 different teams, which results in 256 different game modes! 7. In the full version you can play 8 different soccer teams. This is not football manager type of game, however, you can control your player's starting postitions by switching tactics modes (deffensive/offensive). You can’t buy new units or improve players abilities, so everything depends on your strategic skills. 8. There are also some tricks, which can give you advantage on the football field. 9. Remember to surround opponents, when you tackle the ball. 11. Use each hex on the football field! Try long passes and other strategic maneuvers. Great gameplay, cool graphics and much more. Check it and share your opinion!